The 25-year-old ace from Maldon, Essex will return to the British Rally Championship and will attempt to take a hat trick of titles, battling with some of the most progressive young drivers in Europe in the Junior series. Her domestic campaign will be complemented by once again heading to Spain and Portugal for the Iberica Cup, a single-make series specifically for the potent Peugeot. Fresh from back-to-back British titles and a season in the Peugeot Iberica Cup, Tejpar has gained support from a wealth of local businesses, eager to support her rallying campaign this season, enabling her to tackle a dynamic range of events throughout the year. Tejpar has secured the support of pumping and waste water specialists Pump Technology, who will back the driver for the fourth year in succession. Joining them will be local golf and health venue, The Warren Estate who are avid supporters of her training and fitness regime. Johnathan Barker, Managing Director of Pump Technology is proud to continue their support of the up and coming driver. “We have been following Nabila’s progress for many years and are delighted to be continuing our partnership as she expands her programme this season”. “We have really seen her flourish as a driver here in the UK and it’s great to be part of her journey. We wish her the very best of luck in 2019 and look forward to seeing more silverware at the end of the year”. New-for 2019 sees music & arts management company KYOTO joining the fray who pride themselves on focusing on bands and artists with a unique flair. Tejpar also welcomes Car Art as a backer for the season ahead. The firm takes car parts and “re-imagines” them into wall-mounted pieces. Matrix Construction will also continue support in 2019, along with Speedline Corse UK wheels and Pirelli Motorsport. Co-driven by the returning Max Freeman, Tejpar’s BRC season kicks off with the Cambrian Rally on 9th February, utilising stages made famous by Britain’s round of the FIA World Rally Championship, Wales Rally GB. 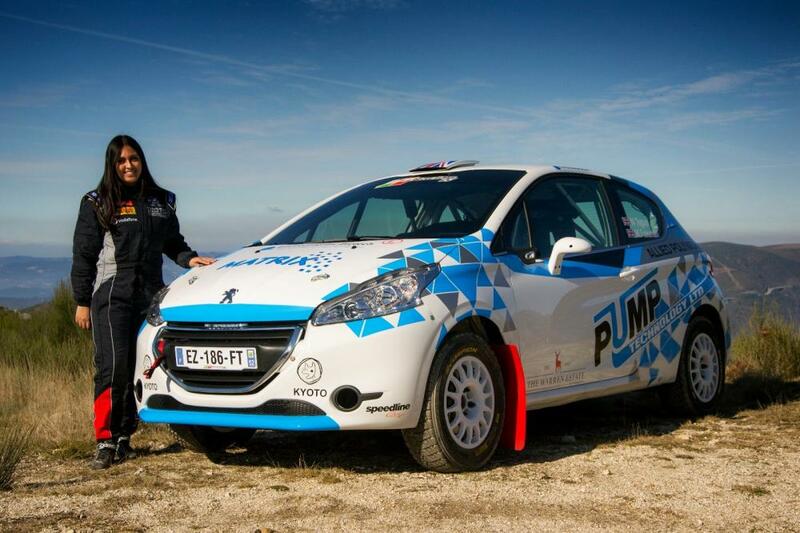 Despite the logistical nightmare of getting her car, from the PT Racing team in Portugal, she is looking forward kick-starting the busy season ahead.“We have been planning this year for quite some time now and I`m really happy to be returning to the British and Iberica Rally Championships this season,” says Tejpar. “I guess from the outside it may look like we are repeating last season’s campaign but we have some other events planned which will really compliment our current assault. The British Championship is really important for my sponsors and also for me. It still is a real breeding ground for talent and as I strive to progress my career, a BRC title is great for my CV. It’s thanks to the support of my backers that I can combine the British and European campaigns this year so I’d like to personally thank them for their support.”. Tejpar will also return to the Iberica Cup as she feels she has unfinished business in the series. “I was happy with how my first full season in Europe went last year but I really knew there was more to come from me” she continues.